A five ingredient sheet pan quesadilla that feeds 8-10 people and takes less than 10 minutes to throw together?!?! Yes friends, it’s true. 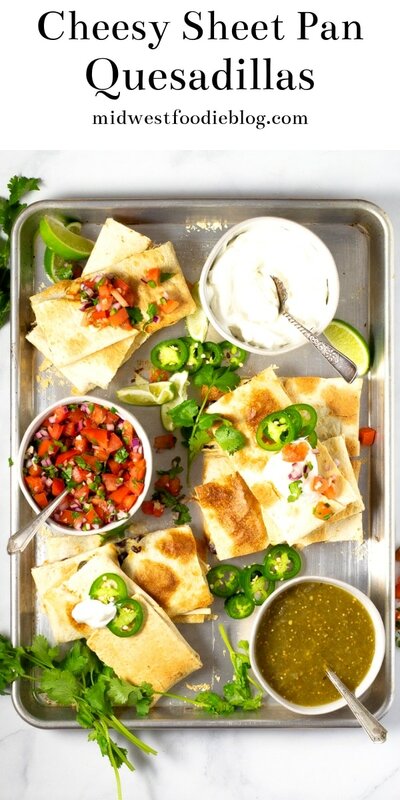 And if you’re feeding a crowd, these sheet pan quesadillas are a MUST. Check out my step my step instructions below! 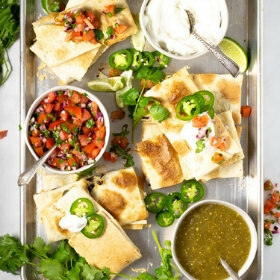 How do I make sheet pan quesadillas? 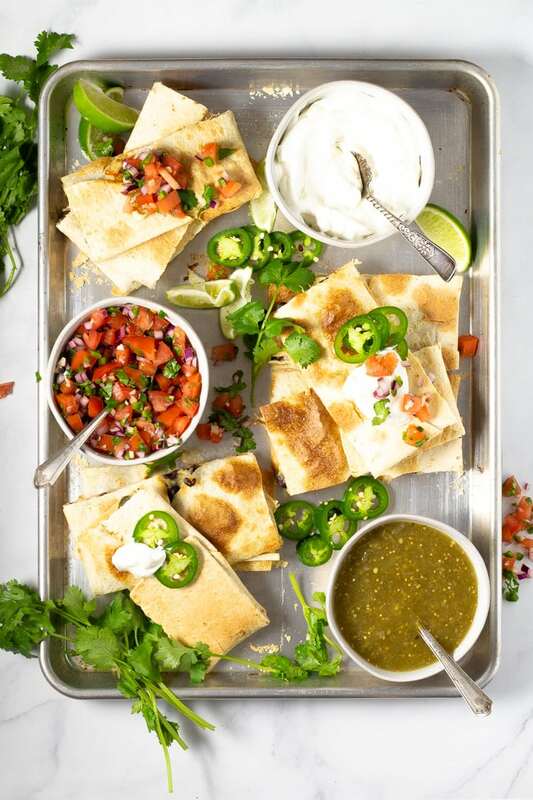 Essentially, you’re making a giant baked quesadilla and then cutting into 8-10 portions. 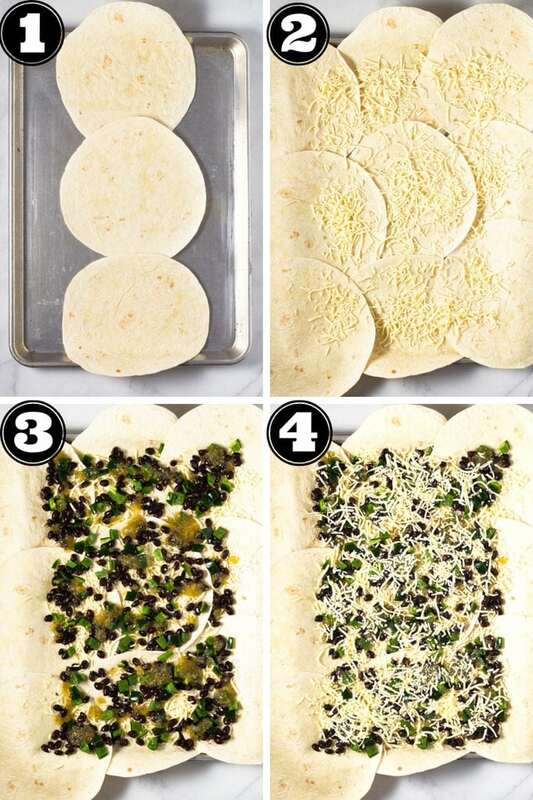 First you’ll start by covering your sheet pan with large flour tortillas and sprinkling them with a layer of shredded cheese (photos 1-2). Then add peppers, beans and a drizzle of salsa verde. Top that with another layer of shredded cheese (photos 3-4). 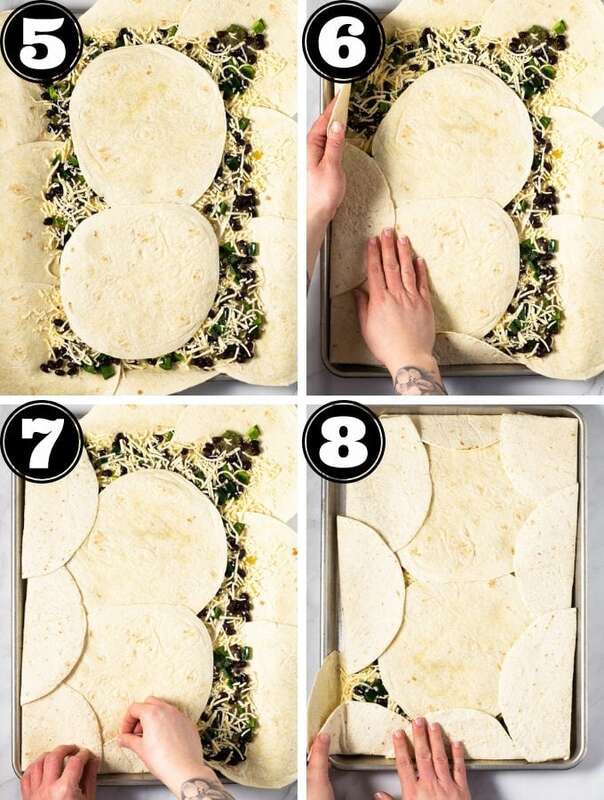 Then place a couple more tortillas in the center and carefully fold the edges of the outer tortillas inward, sealing the cheese and veggies inside (photos 5-8). Then place another sheet pan directly on top of the folded tortillas and bake! The end result is a crispy, crunchy tortilla filled with ooey gooey cheese and veggies! Serve with more salsa verde, sour cream and fresh made pico de gallo. Can I fill my quesadilla with other meats and veggies? Of course! In this recipe I’ve used poblano peppers, black beans, salsa verde and shredded cheese. However, you can use whatever you’d like! This is a great “clean out your fridge recipe” for those times when you have lots of leftovers, but can’t make a coherent meal out of them. Rotisserie chicken, pork carnitas or even leftover fajitas would be great in this recipe! 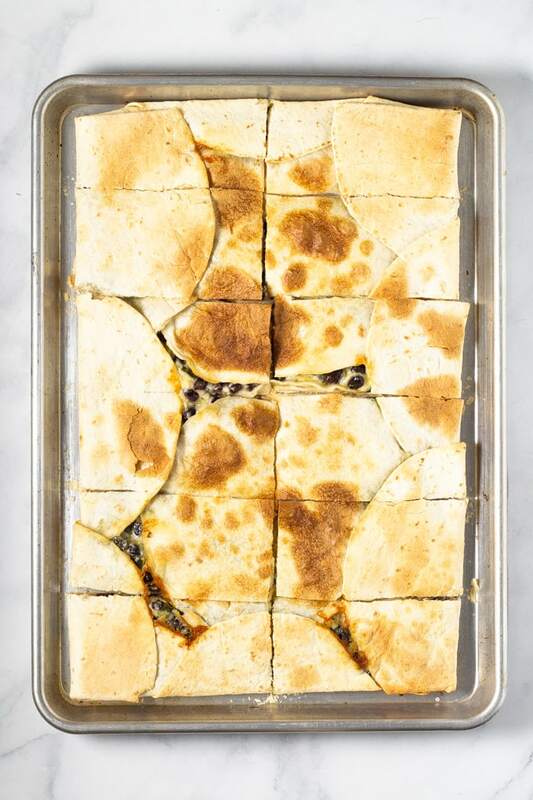 What should I serve with sheet pan quesadillas? I love to serve these quesadillas with my Southwest Chicken Chili or Vegan Lentil Chili. And of course I always recommend serving them with some quick and healthy homemade pico de gallo. Honestly though, these quesadillas are so filling that your favorite hot sauce or guacamole might be all you need! Use a 12×16 inch sheet pan to get the same number of servings as I did in this recipe. If you’re feeding just a couple people, feel free to half the ingredients and use a half sheet pan (9×13 inches). Use large tortillas. Any size tortillas will work, but the larger they are, the fewer it will take to fill the pan. In this recipe I used 8 inch flour tortillas, but the 12 inch burrito size would be great too! Use a good melting cheese. I like to use Queso Chihuahua which is a white Mexican melting cheese that tastes amaaaaazing. Don’t go crazy with the fillings. If you’re going to switch up the ingredients, keep the proportions the same! If you try to fill this quesadilla with too much, it will end up soggy and overstuffed. A five ingredient sheet pan quesadilla that feeds 10 people and takes less than 10 minutes to throw together?!?! Yes friends, it’s true. 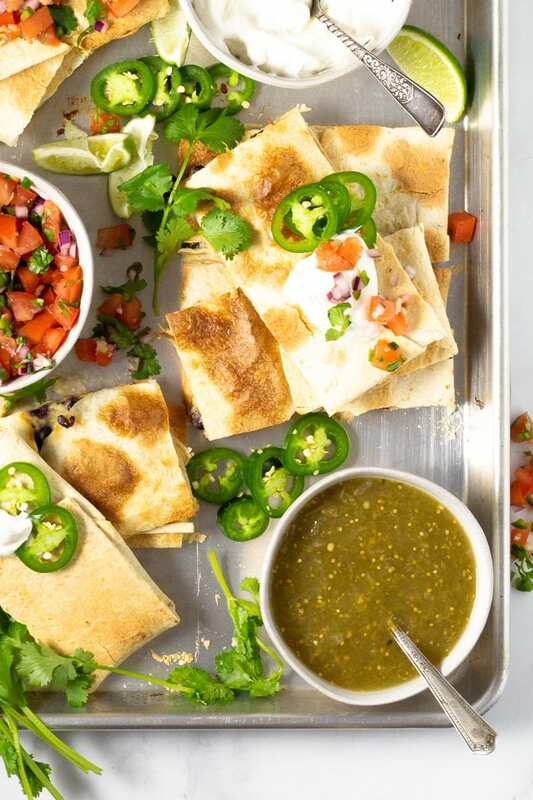 And if you’re feeding a crowd, these sheet pan quesadillas are a MUST. Lay 3 flour tortillas in a line down the center of a sheet pan, overlapping slightly. Add 6 more tortillas to the sheet pan, completely covering the bottom of the sheet pan and allowing the excess tortillas to hang over the edge. Sprinkle half the cheese on the tortillas, then add the beans and peppers in an even layer. Spoon salsa verde over top of the veggies and cheese. Place two more tortillas in the center of the sheet pan on top of the veggies and cheese. Carefully fold outer tortilla edges inward, sealing the filling inside. Place another sheet pan over the folded tortillas and bake for 25-30 minutes or until the bottom of the quesadilla is dark golden brown and slightly crispy. To make the top a bit more crisp, broil for 1- 2 minutes. 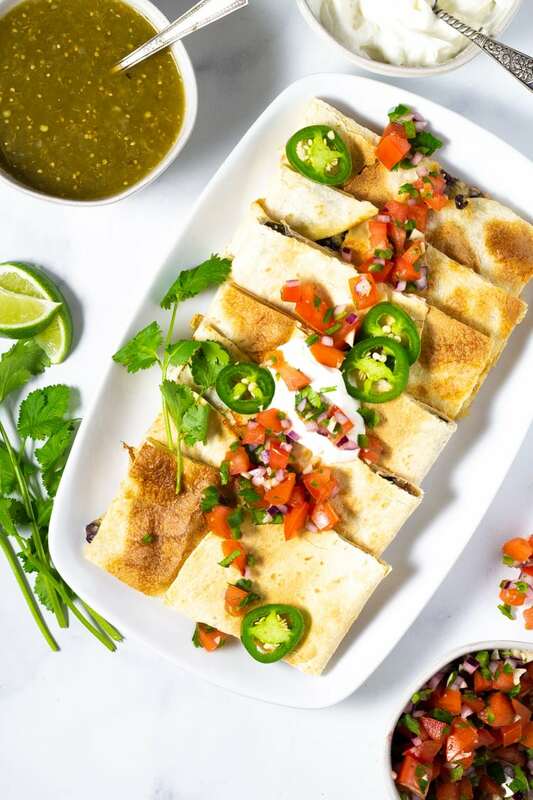 Cut quesadilla into 10 rectangles and serve with salsa, sour cream and pico de gallo.